Last December, University of New Mexico Civil Engineering Department Chair and Professor Mahmoud Taha, and Associate Professor of Civil Engineering Mark Stone, traveled to the Suez Canal to speak about infrastructure resilience at a conference sponsored by the National Science Foundation. Stone presented a talk on ways to apply resilience theory to socio-ecological systems and how that framework can be applied to water resources infrastructure projects, while Taha chaired the workshop and talked about methods to quantify infrastructure resilience. Mark Stone lecturing at US - Egypt Workshop: Toward Resilient and Sustainable Infrastructure Development at the New Suez Canal Region in Egypt. Taha, a native Egyptian with many contacts in the country, conducts research at UNM on ways to monitor bridges for signs of stress. At the conference, he spoke about how having monitoring systems in place on structures can help plan for and recover from severe natural events such as earthquakes, floods and hurricanes. He said with proper monitoring in place the resilience of infrastructure is much easier to evaluate. Egypt has just completed a massive engineering project to double the capacity of the Suez Canal. Ships can now travel both ways on the canal, where once they had to wait hours to join a northbound or southbound convoy on the slow journey between the Mediterranean and the Red Sea. The canal once had one tunnel running beneath it connecting Sinai Peninsula to Egypt. Under the current plan Egypt plans to build six additional tunnels,, including railways. It is part of a vast redevelopment plan for the area between the canal and Cairo, a hundred miles to the west. 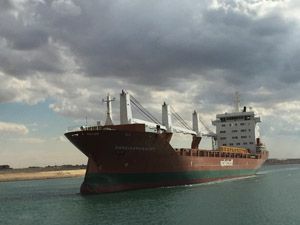 A ship in Suez Canal. Taha said the Egyptian government realized it needed to undertake economic development activity in a major way to provide jobs for the Egyptian youth in the wake of events during the Arab spring. The expansion of the canal and the proposed development of land west of the canal are meant to address that need and to drive economic development in Egypt. Redevelopment of land between the canal and Cairo will require enormous infrastructure projects, and Taha noted those projects must be built with some attention to the impacts on the changing natural environment and the social impact on the people. Resilience, he said, will be fundamental to the success of the effort. Resilience, the ability to withstand or recover from disruptive events such as earthquakes, hurricanes and wildfires is becoming increasingly important at UNM. Taha is now leading a group of faculty members across campus interested in the concept. He and Stone taught a class last fall focused on developing resilient communities at the request of students. That class on resilience was extended in smaller form into the spring semester and students are now engaged in finding a way to build a community center structure in Nepal that is capable of withstanding earthquakes and other disruptive events.